How to let ordinary people make wise predictions for you better than experts. The Wisdom of Crowds by James Surowiecki digs into that phrase and gives excellent examples of how it can be used on the web. I wrote about it earlier after hearing James Surowiecki on MP3 from SxSW. Two weeks ago, Boxes and Arrows (online magazine for information architecture) got into one of the gory details: Prediction markets. Surowiecki’s point is that prediction markets are more accurate than the prediction of experts. For instance, HP employees can bet on what they think product sales will be, and they’re better than HP’s internal predictions 3 out of four times. [Prediction markets] need to make themselves relevant, attract the right types of traders, and teach people who are new to trading how to trade. What follows are some basic and general rules, gleaned from audits of these sites (with selected examples to help explain), about how to improve the communication and simplification of complex ideas about trading, and how to engage users, particularly when developing a prediction market. 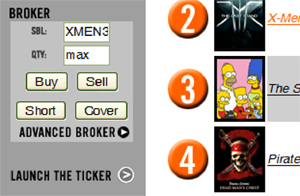 Alex has lots of good examples in his in-depth review of several prediction markets/websites. Apart from Hollywood Stock Exchange (that Surowiecki also covers), there are examples such as Trendio, ProTrade, HSX, Smarkets, Inkling, CrowdIQ, NewsFutures, Yahoo! Tech Buzz Game and more. The Boxes and Arrows article is also focused on what works in the user interface, which makes it an extremely valuable article. This entry was posted by Jesper Rønn-Jensen	on Monday, June 12th, 2006 at 10:39 (GMT-1)	and is filed under Links, Usability, User Interface. You can follow any responses to this entry through the RSS 2.0 feed. Both comments and pings are currently closed. Lots of good examples on projects and startups.